Well, today I saw a turtle getting ready to commit suicide. I was driving home and he was starting to crawl out into the tollway where the trucks and cars were following fast behind me. I looked into my rear view mirror and could no longer him… I knew not what his fate would be. I wanted to stop, to pull my car to the side, to save him. I sit a good four feet off of the ground and from where I am I can see that there is no future beyond the tollway. There is only concrete and barrier. Behind his slow crawl was a vast field of grass and wildflower. I’m sure there were endless bugs for him to munch. And beyond the field was a pond. Perhaps that was his home at one time. His family thought he was "just too much." They criticized him for moving too fast. His shell had too many geometrical shapes. He liked to sleep in the mud. He was ending it all right in front of my eyes and there was nothing I could do. 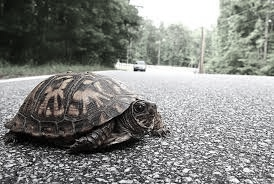 I prayed that he would somehow understand the truth about his sweet turtle self before the tire came along. Perhaps he would see a quick glimpse in the chrome of a passing vehicle. Perhaps that was my vehicle. He would see his reflection and notice his incredibly, artistically created design. He would turn around and look for a pond full of artists and outcasts. So, this story has an upbeat ending. Driving on the road later that day, I saw no totaled turtle bits. I like to think he found hope. And perhaps there’s still hope for the rest of us as well.